Sign in to the WalmartOne website, or the new Walmart Onewire Associate Portal, to see job news, arrange Time Off, check your Walmart work schedule/roster and much more. Get help with any WalmartOne login problems in our FAQ section at the Walmartone login page. WalmartOne has recently become Walmart Onewire, in an effort to merge the Walmartone and Walmart Wire portals. Is there any difference between WalmartOne and Walmart Wire? Yes, there is. The main difference is the fact that employees can only access Walmart Wire whilst physically inside a Walmart store. 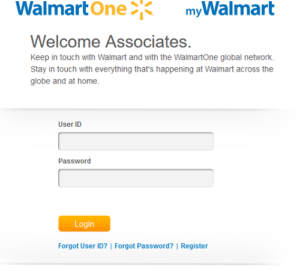 WalmartOne.com, on the other hand, is much more accessible as associates can log in from home or from anywhere connected to the internet via the WM1 app. However, January 2019 Walmart merged the two platforms, and called the new portal “Walmart OneWire”. To learn about the new One.walmart.com portal, and log in, visit our page on Walmart Onewire. I’m a new Walmart employee. How can I create a WalmartOne Account? Creating a WalmartOne account is a very straightforward process. The first thing to do is register with the WalmartOne portal. You will need to complete the online registration form and you will need your personal WIN number, which can be found on your associate paperwork. If you can’t find it, you will need to ask your manager or HR department for help. To register for a new Walmart1 account, visit the Registration Page. When you have entered all your personal details, you will be asked to create your User ID and password. Make a note of these as you will need them to log in. To register for the new Walmart OneWire portal, you will need to sign up for 2-Step Verification at a Walmart Store location. If you need any help enrolling, see our Walmart OneWire help page, or ask your personnel manager. How do I log in to my WalmartOne account? 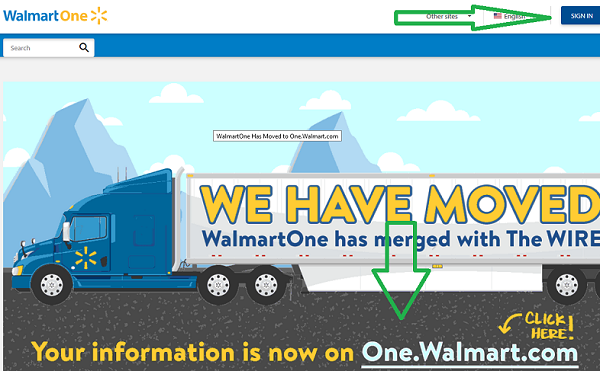 You can either visit the official Walmart One website at www.walmartone.com, click on “Sign In” in the top right side corner and log in with your User ID and password. This login page still works. If you have signed up for 2-Step Verification, then head over to One.Walmart.com, and click on the orange logo. This will take you to the new Walmart OneWire login page. Visit our Walmartone.com login and Walmart OneWire help pages for more information. Alternatively, download the WalmartOne app, or WM1, and log in via your smartphone or device. Search the Google Play Store or Apple iTunes store for “WM1” and you will locate the app. Download it, click on the WM1 icon, and log in with your User ID and Password. This troubleshooter guide will help you if you are having problems accessing WalmartOne. Check that CAPS LOCK is turned off on your keyboard. Passwords are case sensitive. Check that you are using the correct User ID and Password. The Walmartone login credentials are the same which you use in-store to access Walmart Wire). Check that you haven’t temporarily lost your internet connection. It might be worth turning your router off and on again. Try and access www.walmartone.com via another browser, such as Google Chrome, or Microsoft Edge. See if you can successfully log in using an alternative device, such as a monile phone or another computer. Keep in mind that if you are a FORMER employee, your access to Walmartone will have been blocked. How can I view my work schedule on WalmartOne? Walmart has recently launched a brand new app known as “My WalmartOne Schedule”. However, it is also possible to simply log in to www.walmartone.com and view your schedule on the website. How can I access my Walmart paystub information? Simply log in to walmartone.com, or via the WM1 app. You can also access the information by visiting www.paystubportal.com and registering an associate account. I have lost my WalmartOne password. How can I reset my Walmart1 password? If you’ve forgotten your password, you can easily reset by clicking on the ‘Forgotten User ID’ button and following the instructions. A new password will be sent to your email address. Where can I download the WM1 App and My Walmart Schedule App? These apps can be downloaded for free either in the Apple App Store or in the Google Play Store. Search the Apple App Store or the Google Play Store for “WM1” or “My Walmart Schedule” to find the apps. How can I call in sick to Walmart, if I am unable to work that day? You need to call the Walmart Associate Hotline. The Walmart ‘Call In Sick’ number is 1-800-775-5944 or 1-844-292-4796. This HotLine is used by associates to report an absence or if they are going to be late for work. WalmartOne is the official employee website for Walmart Associates, as well as an new app for associates and employees of one of the biggest companies in the world, Walmart. Walmart employs two million people across the world with 4600 stores in the USA and 11600 stores across the world. WalmartOne enables associates or employees to view their working schedule and to keep track of their personal pay and holiday entitlements. 2 Walmart Wire or WalmartOne? 3 Create a WalmartOne Account. 9 I have lost my WalmartOne password. 10 Download the WM1 App. 12 Walmart Call-In Sick Number. Thank you for the info! The Walmart1 system wouldnt let me log in, but i tried another browser as you suggested, and now it works! Go to http://www.walmartone.com, and log in to the website with your User Id. Click on “View Full Schedule”. Download the WalmartOne app, which is available in both the Google Play store, and iOS. Log in to the app with your WIN number and check your schedule. Download the My Walmart Schedule app. Log in to the app with your WIN number and check your schedule. Who is the store manager for Williamsburg Neighbor Market ? I can’t find my walmart login page, just tons of ads! I don’t need to add anything, I just want to print out my schedule why am I having so much trouble! Can not log in to WalmartOne. I am a former SAMS Club assistant manager but need I formation in getting my 401k . Any helpful hints on this? Also need to set up to receive my W2 form by mail. I you have set up a WalmartOne account, you should still be able to access it as a former Sams Club/Walmart employee. Log in to WalmartOne and go to Benefits/401K. You will be redirected to the benefits.ml.com website (Merrill Lunch). If you have questions, call the Merrill Lunch 401K Help Line at (888) 968-4015. Go to MyTaxform.com. The Walmart and Sam’s Club employer code is 10108. The website will ask for your social security number, and then a pin. Your pin code is your birthday. Example: If you were born in May of 1975, my pin would be 0575. The system will ask you a few more security questions. You will then have online access to the W2 for this past year. For a fee, you can also access past Sams Club/Walmart W2s. Walmart will also send you a paper W2. You W-2 will be sent to the last known address in the system. If you have moved, then let Sams Club HR know your new address. After the new app was up and working. I haven’t been able to sign into Walmart to check schedule or anything. I ask for my username it was sent to me but when I try to reset password it tell we my username should have up to 8 letter and a symbol and number. If I try to add anything to username it won’t take it. How do I reset my account or open it to be able to login? How can I can use my Walmart employee discount card for online shopping at Walmart.com? How to Use your WalMart Associate Discount Card on Walmart.Com. Walmart provides associate with an Associate Discount Card. You can use this card at any Walmart location worldwide, AND at the Walmart.com online store. Walmart associates will get a 10 percent discount on any general merchandise (which is NOT already discounted), and on fresh produce. Go to the Walmart.com website. Type in “Associate” into the search box and click on “Search.” (Only the word “Associate”). You will be re-directed to the Walmart Associate login page on Walmart.com. Enter your Walmart Associate ID Number (Social Security number), and your Associate Card Number. Click on “Sign In” and start shopping. I am a former employee of WalMart, I need to update my address for W-2 purposes. How would I go about doing this? Answer: For W-2, go to MyTaxForm.com. The Walmart employer code is 10108. Enter your personal information to confirm your identity. You will then get online access to the W2 for this past year, or pay a fee for past W2s. To change your address in Walmart’s system as a former employee, you need to call (479) 273-4000 and ask for the Walmart payroll department. They will make the necessary address changes in their system so that your current mailing address i supdated when they mail out the W-2. You must do this before they process the W-2s, so before January 31st. If an Associate pays for an item not in stock on the one day of their big discount bonus will the discount apply when product arrives? It’s saying that my username isn’t found even though I registered on Walmart one. WHAT ON EARTH IS GOING ON?! How many billions (mabe trillions) did walmart do last year? why can’t you correct the terrible WM1 app for your employees? I’m trying to get my WIN#. I am retired and have a lifetime discount card. I tried to use my discount card to order something online, but something popped up stating I needed my WIN#. I forgot what it is. I have been trying for about an hour to figure out how to get into benefits to make a change and still can’t figure it out. Have you tried https:// portal.walmartbenefits.com? when i enter my birthday, it says i entered something else, and will not let me change it, what can be done about this? Can anything be made simple? This is as bad as dealing with the snitches at work !! !